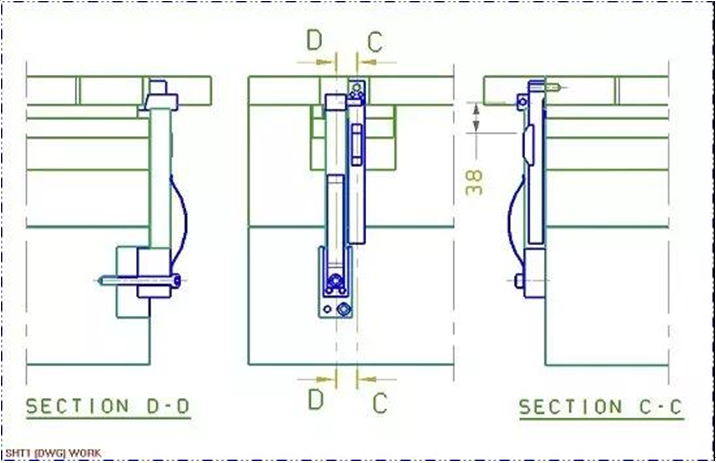 In the two-step parting, two-step ejection or cavity ejection mechanism, a latch lock unit is always employed to control the opening sequence and stroke of each mold plate. Though latch locks perform similar functions, they have a diversity of different structures. 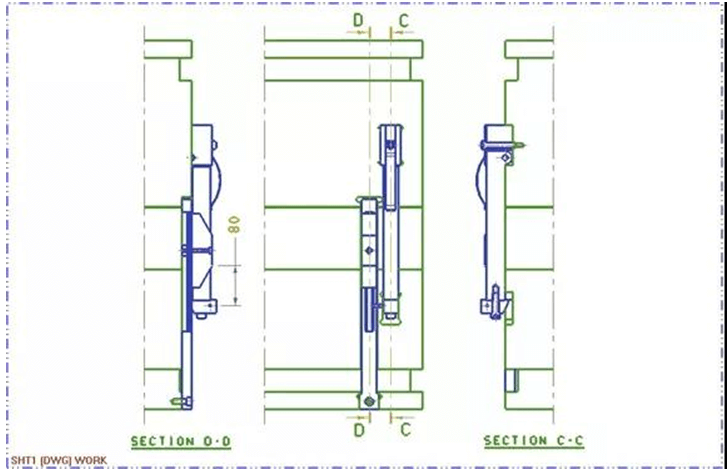 So, it is necessary to select the right latch lock for the right circumstance according the characteristics of the latch lock. The several commonly seen latch lock structures are explained as below. Pros: The Daido latch lock features a simple and concise structure, and requires little machining of the mold base. It takes up a little space and can be mounted on the mold freely, so the chances of interfering with the other parts on the mold base are minimized. Daido latch lock is able to control the mold opening stroke flexibly  a stop block can be mounted on the mold base to realize opening stroke control. In addition, it is inexpensive. Cons: Daido latch lock uses a spring to press the steel ball into contact with the control lever to realize mold closing. As a result, it is not easy to control the clamping force. There are cases of unhooking before reaching the required stroke. It is not so reliable, nor is it easy to adjust. 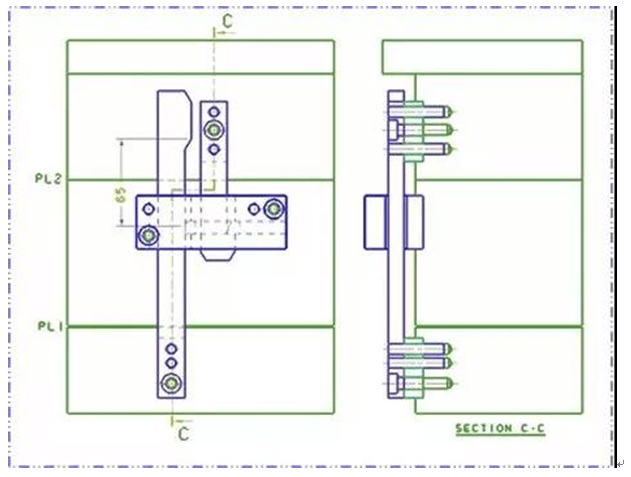 Applicable Scenario: This type of latch lock is suitable for medium-/small-sized plastic injection molds, which do not require a large clamping force or a high reliability. Usually, it is not selected due to its poor reliability. See figure I: Used for the 2-step ejection of the ejector plate. Note: The Daido latch lock uses a spring to press the steel ball into contact with the control lever to realize mold closing. As a result, it is not easy to control the clamping force. It is only applicable for medium-/small-sized molds, which do not require a large clamping force. Pros: Sold at a moderate price, the HASCO latch lock boasts diversified specifications and a wide range of available options; the mechanical closing mechanism is secure, reliable, convenient to mount and requires little machining of the mold base. The lengths of its control lever and hook can be adjusted as per actual conditions. 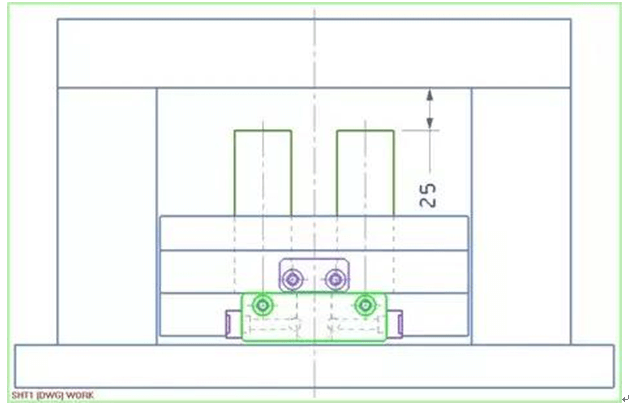 Cons: When mounting, machining is needed after the location of pin holes and screw holes are determined. It is not easy to change the mold opening stroke after it is designed. Also, the stroke range is limited by the length of the control lever. Applicable Scenario: The mechanical closing mechanism is secure and reliable, so it is suitable for various large-/medium-/small-sized molds. Note: It is not easy to change the mold opening stroke after the stroke is designed, and the pin hole and screw hole locations are machined. Also, the stroke range is limited by the length of the control lever. Pros: The mechanical closing mechanism is secure and reliable. A wider stroke range can be covered by changing the relative location between the control lever and the hook. After the latch lock is mounted, the mold opening stroke is still able to be adjusted by moving the adjusting slider on the control lever. Cons: Occupy a larger space; complicated mounting process; require a lot of machining of the mold base; high price. Applicable Scenario: Suitable for large-size molds, and able to cover a wide opening stroke range. Usually, it is not selected due to its high price, unless specified by the client. Note: After the latch lock is mounted, the mold opening stroke is still able to be adjusted by moving the adjusting slider on the control lever. Pros: With a large clamping force, the mechanical closing mechanism is secure and reliable. Its biggest benefit is that the mold opening stroke is able to be adjusted by moving the adjusting slider after the latch lock is mounted, so a wider stroke range can be covered. 3. Applicable Scenario: Suitable for large-size plastic injection molds, and able to cover a wide opening stroke range. Usually, it is not selected due to its high price, unless specified by the client.